Given a simple graph G with n vertices, m edges and k connected components. 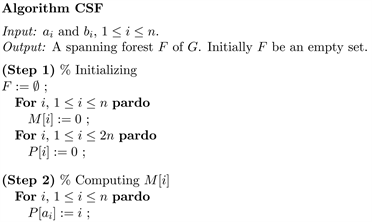 The spanning forest problem is to find a spanning tree for each connected component of G. This problem has applications to the electrical power demand problem, computer network design, circuit analysis, etc. In this paper, we present an O ( l o g n ) time parallel algorithm with O ( n / log n ) processors for constructing a spanning forest on proper circle graph G on EREW PRAM. 1. Wilson, R.J. (1996) Introduction to Graph Theory. Prentice Hall, London. 4. Wang, Y.L., Chen, H.C. and Lee, C.Y. (1995) An Parallel Algorithm for Constructing a Spanning Tree on Permutation Graphs. Information Processing Letters, 58, 83-87. 5. Wang, Y.L., Chiang, K.C. and Yu, M.S. (1998) Optimal Algorithms for Interval Graphs. Journal of Information Science and Engineering, 14, 449-459. 9. Even, S. and Itai, A. (1971) Theory of Machines and Computations. Academic Press, New York. 10. Golumbic, M.C. (2004) Algorithmic Graph Theory and Perfect Graphs, Volume 57. 2nd Edition, Elsevier, New York. 17. Asano, T., Imai, H. and Mukaiyama, A. (1991) Finding a Maximum Weight Independent Set of a Circle Graph. IEICE Transactions on Fundamentals, E74A, 681-683. 18. O.Goldschmidt, A.T. (1994) An Efficient Algorithm for Finding a Maximum Weight Independent Set of a Circle Graph. IEICE Transactions on Fundamentals, E77A, 1672-1674. 19. Valiente, G. (2003) A New Simple Algorithm for the Maximum-Weight Independent Set Problem on Circle Graphs, ISAAC. In: Lecture Notes in Computer Science, Vol. 2906, Springer, Berlin, 129-137. 23. Gibbons, A. and Rytter, W. (1988) Efficient Parallel Algorithms. Cambridge University Press, Cambridge.